Some of my mother’s friends were surprised not to see my name on the Primary Election ballot. While I have been campaigning every two years since 2010, I am not running for office this year. State Senators have four-year terms and it’s the other two Maui Senators who have races in 2018. A friend of mine is counting down the days until Wednesday, November 7th. His mind is a million miles away. He’s only in country for a couple more weeks. He’s short. You see this is his last campaign. After the Mid-term election, he is retiring from taking active roles in local political races. He says this time it’s for real. He’s been around politics for much of his sixty or so years. But he still has a reputation for having some of the best instincts about Maui voters over the last three decades. But he believes he’s done his time and campaigning is very much a young person’s game. Frankly, I think he’s just kidding. If someone he liked really begged him, he’d do it again. But political campaigns have changed. It’s no longer a real community effort. 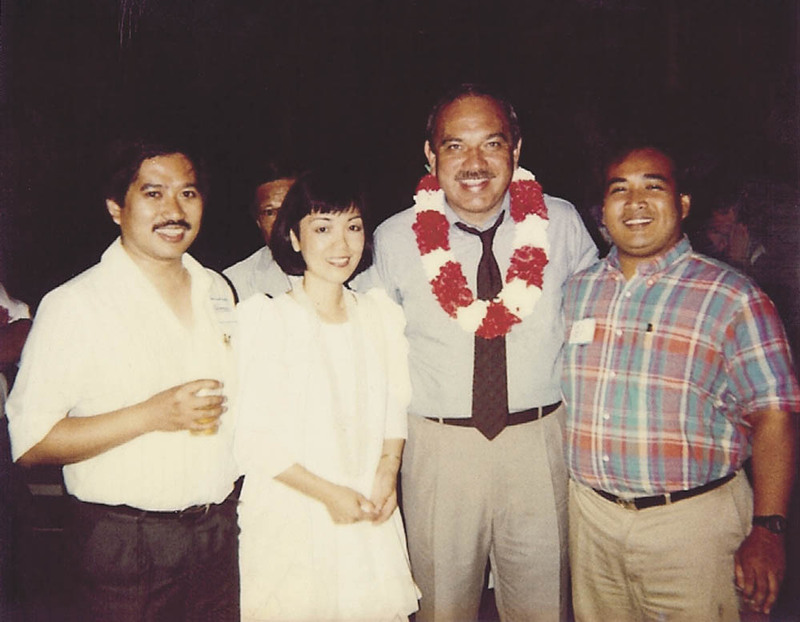 Campaigning for the Waihee-Cayetano team in 1990. 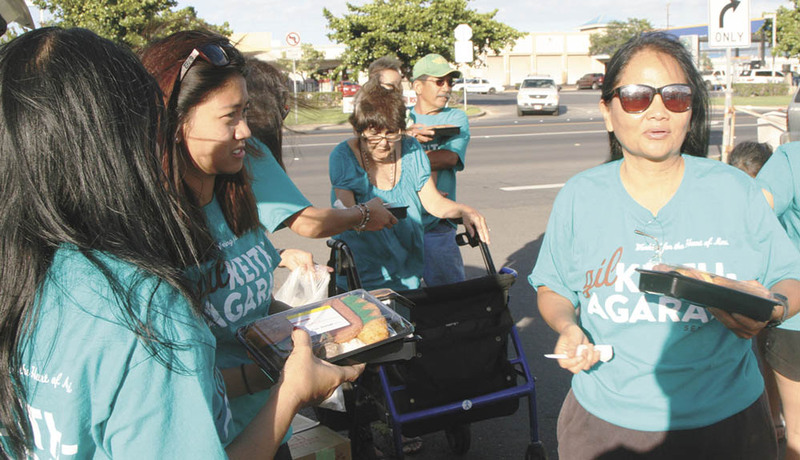 In a major campaign, you used to get a daily meal—the best hekka I ever had was at John Waihee’s headquarters in 1990. Bite-sized bits of chicken, fresh bamboo shoots, carrots, sweet onions and just the right amount of bean thread. Food you had to eat hot over rice. Fred Evangelista and I got volunteered as the Ben Cayetano people on a committee to write a Filipino plan for the Waihee-Cayetano general election campaign. We gained ten pounds each that summer. It’s a secret but food used to make or break a local style campaign. Good chili makes sure the signwavers keep showing up. If your volunteers make good desserts, people will remember to come by election night. But I do have a pet peeve. Namely, stew and rice. It sounds like an easy dish but I’m agin’ it. There are too many ways to blow it—tough meat, or too soft carrots, or too much vinegar—poe ho—and then you’re left with just your uncle and your unemployed cousins to walk house to house. After signwaving we pass out bentos to our volunteers. But the world is changing and we really don’t understand it as well as we did. Most campaigns no longer have headquarters with kitchens where volunteers can hang out in air-conditioned comfort during the hot Maui summer. I heard of one campaign this past year made sign wavers potluck. But at least they also got t-shirts and some water. When Big Islanders and Kaua‘i folk derisively complain that developers want to turn their islands into another Maui, what’s wrong with that picture? 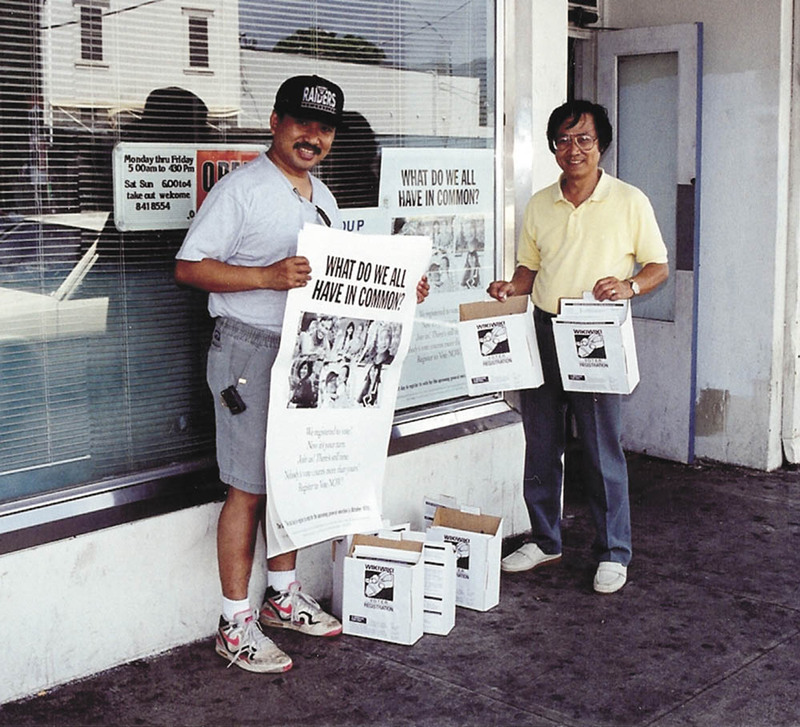 In 1994, canvassing homes and businesses for a Voter Registration Drive (right). 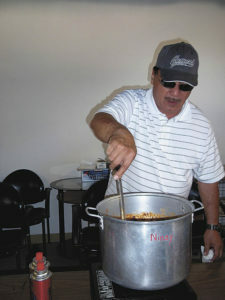 Richard Caldito, Jr. is shown here cooking chile for a political campaign event (left). And that may be as good a reason as any to leave politics to the young people. In 1994, we walked house to house throughout the County. We caravanned in Tony’s and Ted’s trucks to Hāna. We took day trips by ferry to Lāna‘i and Molokai. We cut yard signs from plywood and silk-screened hundreds of signs. And Wes, Fred or Manabu cooked a hearty lunch for the canvassing crews each week. By 1998, we could see the changes. We discovered pastures subdivided into house lots in Ha‘ikū. We found formerly local portagee neighborhoods apparently operating as toney transient accommodations. We found people preferring direct mailing when we tried to walk Kula and Maui Meadows. We walked fewer areas—writing off areas that we assumed would not even consider our candidate. But we still relied mainly on local people as volunteers. Retirees spent time at HQ before or after tee times. Sign wavers came after work. People called friends and neighbors after dinner. We silk-screened many of the signs used throughout the State and not just on Maui. That same year, several candidates hired mainland consultants for local races. And some legislative candidates bought commercials on cable TV. Gilbert S.C. Keith-Agaran has represented Central Maui in the legislature since 2009. He lives in Kahului where he grew up. He currently serves as Vice Chair of the Ways and Means Committee and as Assistant Majority Whip. He previously served as Chair of the Senate Judiciary and Labor Committee and Chair of the House Judiciary Committee. 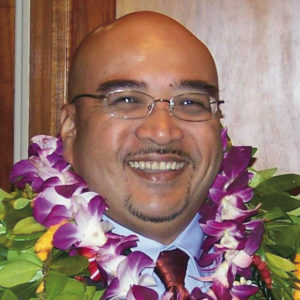 Before being appointed to the legislature, Mr. Keith-Agaran was active in his church, served on the School Community Councils at Maui Waena and Maui High School, and a member of the boards of various local non-profit organizations, including the Maui Coastal Lands Trust and the Maui Memorial Medical Center Foundation. He previously served as an administrator in the Cayetano and the first Arakawa administrations. In the past, you counted how many yard signs you passed in particular neighborhoods. Now the home occupants at the best spots let anyone put up a sign—even the lolos. Candidates compete to stack signs or to put up billboards that would make the Outdoor Circle blush. Yard signs no longer hint at support, indifference, hostility or annoyance. So it’s nice post-Primary to drive around Kahului and to see fewer and more reasonably sized yard signs and banners. My soon-to-be retired friend understood the value of polls, whether taken in the media or in the Sakura card games at old Kahului Shopping Center. Like other things, polls or what people were saying gave you a sense of how people were leaning about particular races and candidates. Now you have people who don’t have land lines but who may be voting. There are fewer places where people just gather around to talk story. How do you gauge what the wireless folk are thinking? This year, I sense the mainland style campaign has arrived in earnest. Paid full-time handlers advise candidates about messages and dialing for dollars. Cheap mass-produced yard signs and large banners get hung way before the accepted date for putting out the signs. Money once spent on cheap rent for a Maui campaign HQ now goes to direct mailing, polling or paid media. And Super PACS spend hundreds of thousands of dollars to support a candidate for Lt. Governor of all offices. And as a result, no daily meal for campaign volunteers. So if you gotta retire from politics, sounds like a good time. But canvassing, without an after-walk bento, would certainly be one way to get in shape.